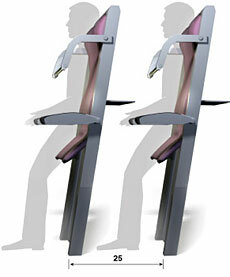 Accelerating the indignities of airplane flight way beyond what any of us could have imagined, now Airbus Industries has proposed a standing room concept, apparently the next step toward sliding passengers into drawers resembling a morgue, or packing them onto layered plank-bunks reminiscent of 17th-century slave ships. It's not enough that the average space between economy class seats (or "pitch," as it's known in industry parlance) has lost three inches since 1978. Trying to offer relief was Boeing, introducing its 787 Dreamliner with recommended eight-abreast seating. But no. More than half the airlines (probably mostly US carriers) who ordered the plane will cram nine seats into that same space. For their next trick, we predict the greedy, loser US airlines will issue each passenger a bale of straw, a pee bucket and a ladle of corn mush.